Where you live can influence greatly the educational outcomes of your children. Some education observers go so far as to say: “The quality of education is determined by your postal code.” In school systems with strict student attendance zones, it is, for all intents and purposes, the iron law of public education. Not to say your mailing address and which school your child goes to determines all. Students, whatever their background, can overcome significant disadvantages. Former U.S. president Barack Obama, for one, urged parents to empower children rather than encourage excuses. How a school district identifies struggling schools and how it responds is what matters. Simply using family income to explain away differences in performance and outcomes isn’t good enough. Neither is ignoring those stark realities. It only serves to reinforce the ingrained assumption, contribute to lowered academic expectations, and possibly influence school leadership, student behaviour standards, teacher attitudes, and parent-school relations. While there are risks involved in comparing school performance, parents and the public are entitled to know more about how students in our public schools are performing in relation to socio-economic factors influencing student success. The Halifax Regional Centre for Education (formerly the Halifax regional school board) has 47,770 students in 135 schools. Student achievement and attainment results over the past decade, from 2008-09 to 2015-16, have been published in school-by-school community reports and, when aggregated, provide clear evidence of how schools are performing in Halifax region. Former school board superintendent Carole Olsen introduced the existing accountability system in 2008-09 along with a new “good schools to great schools” mission that set a far more specific goal: “Every student will learn; every school will improve” within five years. Following the release of aggregated board-wide data, the school board produced school-by-school accountability reports, made freely available to not only the school advisory councils, but to all parents in each school. School-by-school reporting was critical to the whole project. “Knowing how each school is doing is the first important step in making sure resources and support reach the schools — and the students — that need them the most,” Olsen declared. The school year 2008-09 provided the benchmark for the board and for this series of articles taking stock of student achievement and school-by-school performance over the past decade. 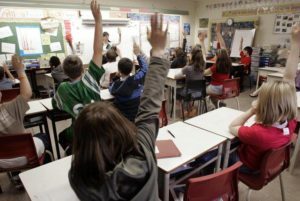 The first set of student results in reading and math demonstrated that Halifax-area student scores were comparable to other Canadian school systems, but there was room for improvement. In Grade 2 reading, the system-wide target was that 77 per cent of all students would meet established board standards. Only 25 out of some 91 schools (27.5 per cent) met or exceeded the established target. While Grade 2 and Grade 5 mathematics students performed better, problems surfaced at the Grade 8 level, where two out of three schools (67.5 per cent) failed to meet the board’s standard, struggling with measurement, whole number operations and problem-solving. In September 2012, Olsen was appointed the province’s deputy minister of education. The robust commitment to school-by-school improvement and demonstrably improved standards in reading and mathematics faltered and the school community reports, appended routinely as PDFs to school websites, attracted little attention. Twenty of its 84 elementary schools were identified as struggling and designated as priority schools requiring more attention, resources, and extra support programs to close the student achievement gap. The focus changed once again, when the 2017-18 provincial results in Grade 6 math and literacy revealed that struggling students came disproportionately from marginalized communities. So a school improvement project focused on schools drawing from lower-income neighbourhoods was transformed into one addressing differences along ethno-racial lines. As this series continues on Thursday, we will see how an in-depth comparison of school-by-school performance over the past decade runs smack up against “postal code education” assumptions, raises critical questions and yields some startling results. Paul W. Bennett is director of Schoolhouse Institute, Halifax and author of Raising the Bar and Closing the Gap: Schools, Income and Student Success.